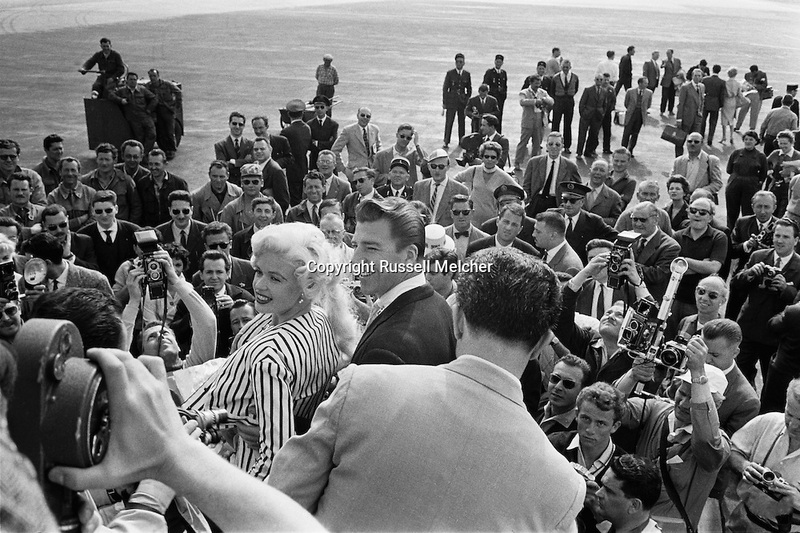 Jayne Mansfield, arrives at Nice Airport on the way to the Cannes Festival. French Magazine Paris Match was so worried I would follow her all the way to Cannes instead of filing my story, they kidnapped both her and my bags. Fortunately, when she realized what had happened, she got my bag delivered to my hotel, via her magnificent white limo. Jayne Mansfield , arrive à l'aéroport de Nice sur le chemin du Festival de Cannes. Paris Match était si inquiet je la suive jusqu' à Cannes au lieu de déposer mon film, ils ont kidnappé nos sacs . Heureusement , quand elle a réalisée ce qui était arrivé , elle a fait delivré mon sac à mon hôtel , via sa magnifique limousine blanche .